Washrooms with a five-step process on getting the toilet to flush. One association I knew had a problem with stray cats getting in through a hole in the wall and camping on top of their filing cabinets. If you’re living in your own nightmare, or just looking to upgrade your office space, furniture, supplies, computer equipment, or software, you’ve come to the right place. What’s the reason you’re staying in your current office space? Is it the only place you think will fit your budget? Have you just always been there? If you’re open to moving spaces, there are a number of websites similar to Airbnb that specialize in finding inexpensive, furnished office spaces with all the amenities (internet, fax machines, washrooms, etc.) in whatever city you operate in. How many desks, computers, fixtures, couches, or supplies do you need? Do you need TV screens, a whiteboard, a chalkboard, etc.? Do you need an ensuite kitchen, a waiting room, etc.? How many days or months do you need the space for? Pet friendly? Phone access? Mailbox services? Printer? Storage? Other special requirements? Breather: Great for workshops, events, and offsites . Compass: Lists local shared workspaces. Craigslist or Kijiji: Search through local listings. LiquidSpace: Find single working spaces for as low as $25/month. MeetingsBooker: search venues ideal for conferences, workshops, and events. Ofixu: Offices, spare desks, meeting rooms, creative spaces, coworking spaces, and more. PivetDesk: temporary offices, shared spaces, and private office space for nonprofits. Qdesq: find any type of workspace around the world. ShareDesk: find any type of workspace. If your organization is small enough, running it from home may be an option to consider. The Canadian Association of Law Libraries (CALL) is a 400-member organization that does this. They operate entirely out of volunteers’ homes. If you choose to run your organization from home, you will still likely need to setup a PO Box to accept mail. A PO Box can cost anywhere from $50 per year to a $1,000 depending on your location and the size you need. Here are instructions on how to rent a PO Box in your area (for Canadian PO Boxes click here). Another thing to watch out for is separating home expenses from the nonprofit’s expenses. While you may be able to claim certain office supplies like ink, or stamps, you may not be able to claim deductions for the use of your house and furniture. Lastly, you need to consider your home environment. Pets and kids can be major distraction, potentially standing in the way of productivity. Here are some tips on working from home with kids. Computer Recycling Center: fill out a request for computer equipment. CSR Eco Solutions: a global social enterprise managing the redistribution of redundant assets on behalf of corporations, government institutions and healthcare facilities. DeliverGood.org: connects companies with used equipment to nonprofits who need it. ERA.com: A place where people post computer equipment they don’t need anymore. FreeCycle.org: a marketplace where people post furniture and supplies they have to donate. Good 360: a place where companies donate products to nonprofits. GreenStandards: sign up to receive gently-used office furniture and equipment donations delivered right to your door. Interconnection.org: gives out nonprofit computer grants. Recycles.org: a nonprofit recycling and reuse network — this can be a great place to find free computers for nonprofits. Craigslist: The largest classified advertisement website. Search for people selling (or giving away) furniture and computer equipment in your locality. Overstock.com: Overstock sells surplus and returned furnishings as well as new items for less than wholesale cost online. You can find especially good deals if you search their clearance section. Furniture Stores That Sell Floor Models: Sometimes furniture stores will let go of floor models for a large discount. The only way to find out is to ask. Goodwill, The Salvation Army, or other thrift stores. IKEA: IKEA is the gold standard of inexpensive furniture. I’ve also heard some locations donate furniture to eligible nonprofits. While this may not be true everywhere, it’s worth getting in touch with your nearest location. Contact TechSoup, an organization that distributes software to nonprofits for free or a discount. 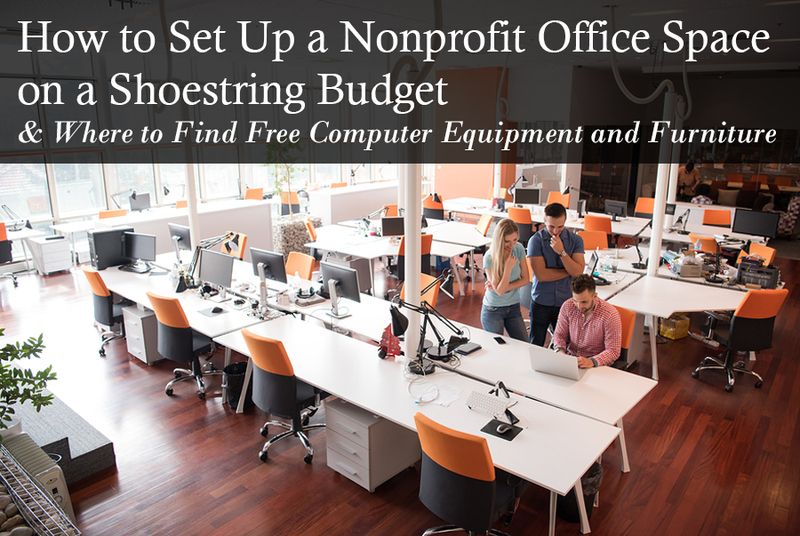 Browse this list of 199 free or cheap software tools for nonprofits. Contact the software provider’s sales staff. Often companies provide a discount for registered 501(c)(3) nonprofits. Join or donate to the Free Software Foundation. Association Management Software, also known as AMS, is an all-in-one management tool comprised of a website builder, online contact database, communications system (email), finance & payment system, event platform, and more. resources, member directory, an event calendar and more. Provide you with financial reports, analytics, and membership summaries in seconds. Wild Apricot is one of the highest rated AMS tools. Every day over 7,000 associations use Wild Apricot to completely manage their associations. Start your free trial of Wild Apricot now. In just an afternoon you can have a full website and contact database setup to begin communicating with your residents and tracking their payments. "Wild Apricot has been a lifesaver for our association. It saves us at least 15-30 hours of work every time we have an event. It's simple to send email blasts, track payments, and keep in touch with former members who may have drifted away."